Looking to renovate your home’s interior or exterior in Cooper City, Florida? You came to the right place! 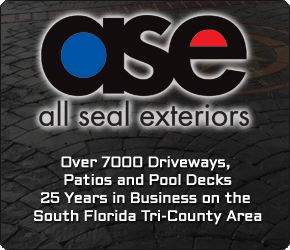 With 25+ years of experience, All Seal Exteriors has a track record of over 7000 driveways, patios and pool decks completed, with thousands of satisfied customers. We do over 10 projects a week, and more than 500 projects a year. We stand out from our competitors for our experience, value and selection of services. After all, we are the #1 Choice in Stamped Concrete and Pavers in Cooper City. Please type in the letters you see above. Letters are case sensitive. From beginning to end, this company does GREAT work! Their advice about my pool deck (to put down pavers as opposed to concrete stamping) was spot on, and their guy who came and spray decked the carport and shuffleboard court did an EXCELLENT job, what a professional! He was there early every day, and did immaculate work from start to finish. Highly recommend KP, his team, and this company! If you need exterior work done in SoFla, this is your best choice.